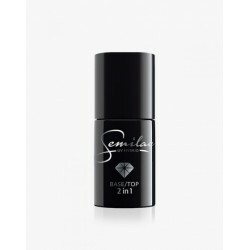 BASES Y TOP Hay 9 productos. ES UN PRODUCTO FINALIZADOR PARA EL ESMALTADO SEMIPERMANENTE QUE MATIZA CUALQUIER COLOR. SE APLICA ENCIMA DE LA SEGUNDA CAPA DE COLOR. NO REQUIERE SER LIMPIADO CON CLEANER. ESTA BASE ALARGA TUS UÑAS HASTA 1 CM.